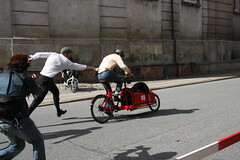 Copenhagenize.com - Bicycle Urbanism by Design: Svajerløb 2010 - Cargo Bike Race! 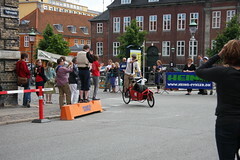 Svajerløb 2010 - Cargo Bike Race! 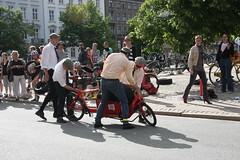 The Copenhagenize.com RedRum team after the 2010 Danish Cargo Bike Races. We finished fourth in the team relay on my new red Bullitt. 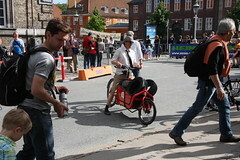 I loaned the old white Bullitt to some colleagues from the Velo-City conference and they won bronze. So... I have a bronze medal bike! What a great day. Sunshine and bike racing. 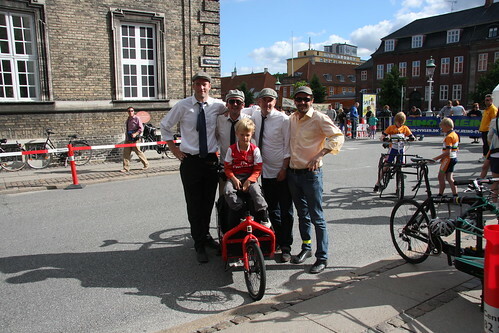 The Copenhagenize.com team dressed up for the occasion, donning clothes that the bike messengers back in the day used to wear. We won the first heat but finished fourth in the final. 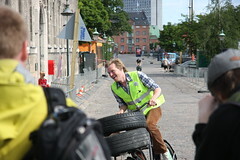 One lap empty and then we had to load the bike with two tires and a bundle of newspapers. 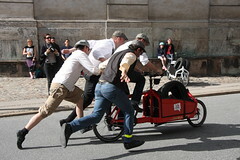 The three following laps, but three riders, had to carry the cargo. 1.3 km of headwind and cobblestones. Once the rider was switched, we gave him a push to get him on his way. Here's the start riders for the final, but they organisers ended up dividing us into two heats. 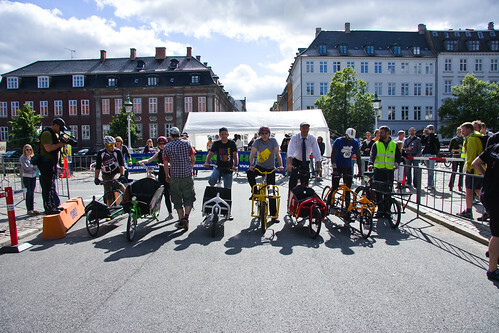 There was also a Brompton race for the first time ever. 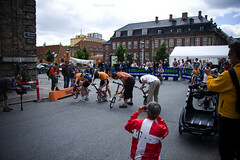 The Danish championships. 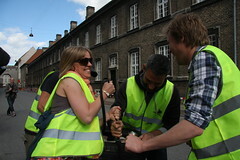 Four participants took part. Not surprising considering that we have very few folding bikes in Denmark and nobody outside of the bicycle business has ever heard of the Brompton. But Fidelius, from Vienna, came to Velo-City and ended up wearing a bronze medal. Congrats! 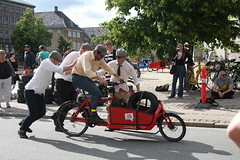 The Museum of Copenhagen team in action, strapping the tires to their vintage Short John delivery bike. Here are the proud medalists. 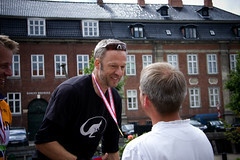 Claus, one of the city's top bike mechanics, took gold this year. Hans, from Larry vs Harry at right, took bronze. 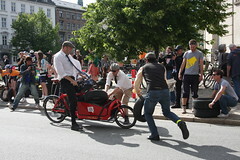 The chap on the right won the three-wheeler gold. 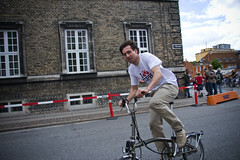 He's a bike designer for Winther. Here's me and my friend Claus and me giving him a fashion/history lesson about how the old cargo bike messengers used to dress. He has promised to show up next year with a bit more style sense and respect for history. :-) But a warm congratulations to Claus for winning gold and becoming the reigning Svajer Champion until next year! Thanks to everyone who took part or came out to watch! 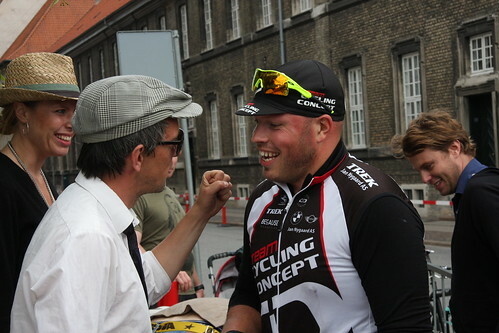 Thanks to Eric from Firmacyklen.dk for his race organising genius and to Amager Cykel Ring for their massive help. See you next year!